The Crumbs Bake Shop on the Upper West side of Manhattan was a pleasant discovery. 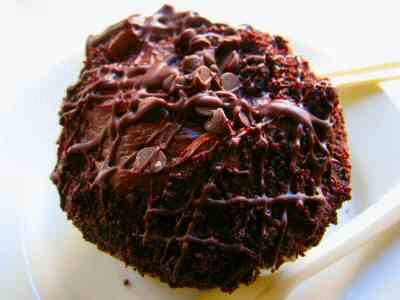 I was walking along Broadway near 109th St and suddenly had an urge to eat something sweet. Voila, I hit a jackpot in Crumbs Bake Shop. 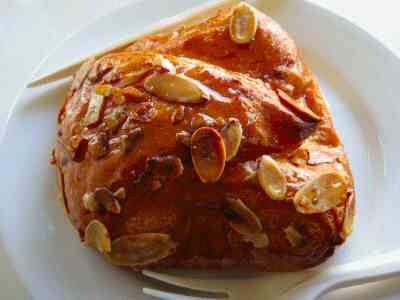 I tried a Cheese Danish with Almonds toppings ($2.75) and a Dark Chocolate Cup Cake ($3.95). Both Cheese Danish and Dark Chocolate Cup Cake tasted yummy and fresh. And the Super-Sweet staff was a bonus on the day of my visit. I sat on a tall stool by the glass window and in serenity watched the bustling world outside. God, I hope this store survives the recession. Cheap: Breakfast Special Coffee & Pastry $3.60; Super-Sweet Staff Bonus. 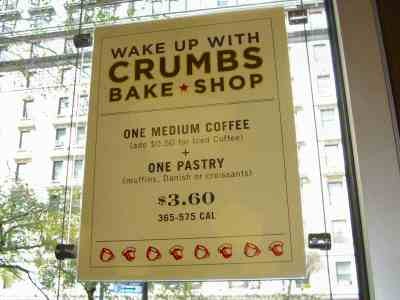 By the way, Crumbs Bake Shop on Broadway also has a $3.60 Breakfast deal – one medium coffee with one pastry.